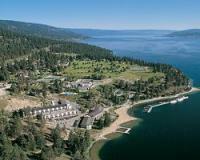 Lake Okanagan Resort is situated amidst 300 acres of natural parkland on the shores of Lake Okanagan. The resort features an executive par three golf courses, tennis courts, full service marina, beach, stables as well as miles of hiking and birding trails plus extensive summer activity programs. The area boasts over twenty wineries as well as numerous championship length golf courses, all within easy driving distance. Three downhill ski facilities are just over an hour's drive away.